Just some of the many subjects covered when my friend David Woodhead dropped in yesterday! 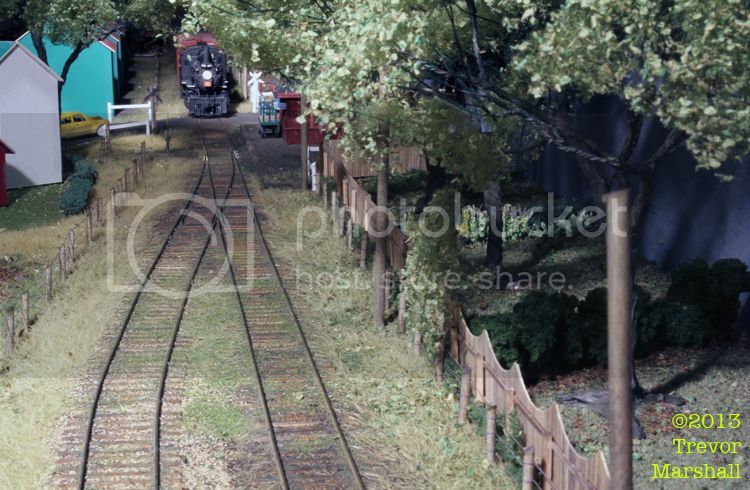 After a couple of strong mugs of coffee – it was cold, and he walked over from his place about 15 minutes away – we headed to the layout room and ran an extra freight behind CNR 10-wheeler 1532. David wanted to have a go as conductor, so I handled the throttle and he juggled the paperwork. A fine time was had – plus all lifts lifted and spots spotted correctly, so I guess the 1:64 customers along the Port Rowan branch were pleased, too. We had an issue with one boxcar. The train line air hoses were too long, and were catching in the frogs of turnouts. I hauled the car off the layout, pulled the glad hands out of the ends of the flexible hoses, snipped them shorter with a handy pair of scissors and replaced the glad hands. In no time, the car was back in service – problem solved! 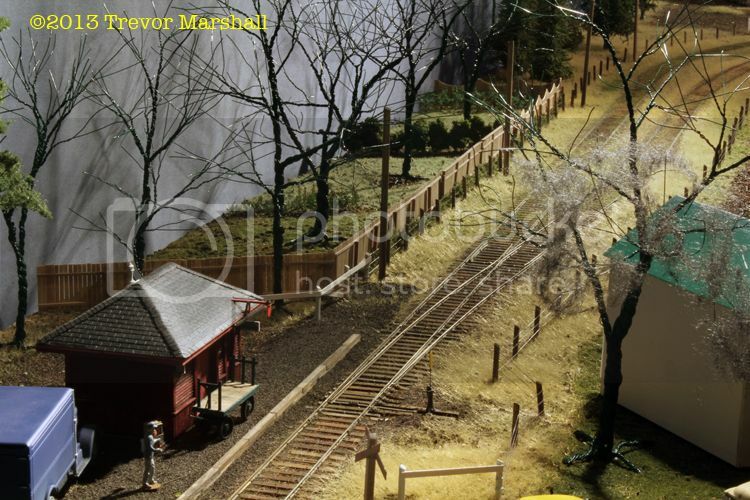 These are the sorts of issues that only crop up if one runs their layout – yet another reason to do so often! I like the tree line that he added to the image with PhotoShop – a nice touch. Great to see you as always, David – let’s do it again soon! 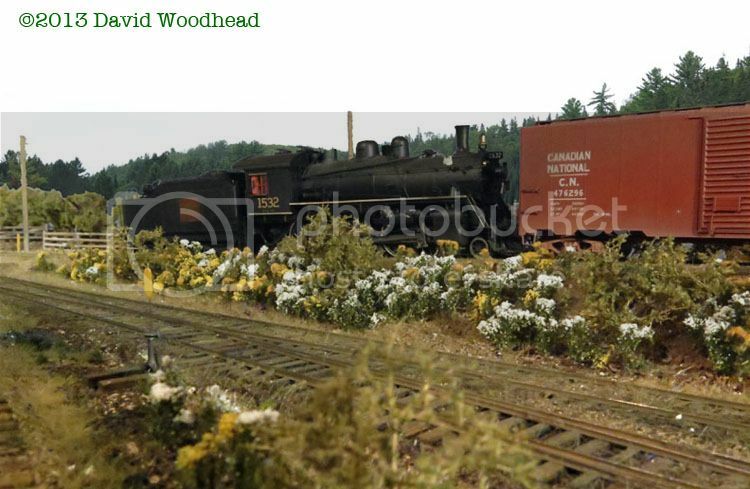 The author, Bill Gill, works in HO scale but there’s some great information for all modellers – regardless of scale. For example, Bill shows how he’s loaded a pick-up truck with bushels of apples – and tells you how many bushels fit in a typical half-ton pickup. I now know how many milk cans a pick-up can carry too – it’s less than I thought. Other trucks Bill models include a telephone linesman’s rig, a stake bed truck with a load of hay and a couple of beat-up pick-ups that have seen better days. 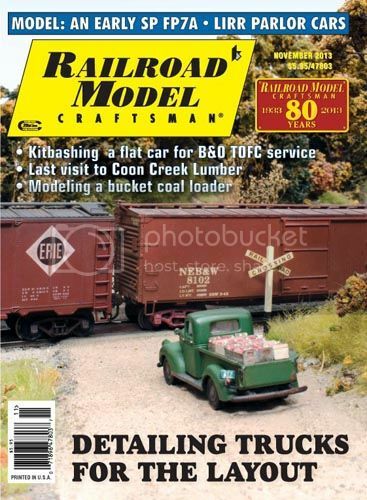 Click on the magazine cover to find this issue on RMC’s website. I decided, after much consideration, that my summer scene was just too hot and dry. The grass was baked to a golden straw colour – more reminiscent of California than Canada. So yesterday, I addressed the problem: I airbrushed the layout. I added green in random splotches and stripes, being careful to not hit the backdrop or the river surface. 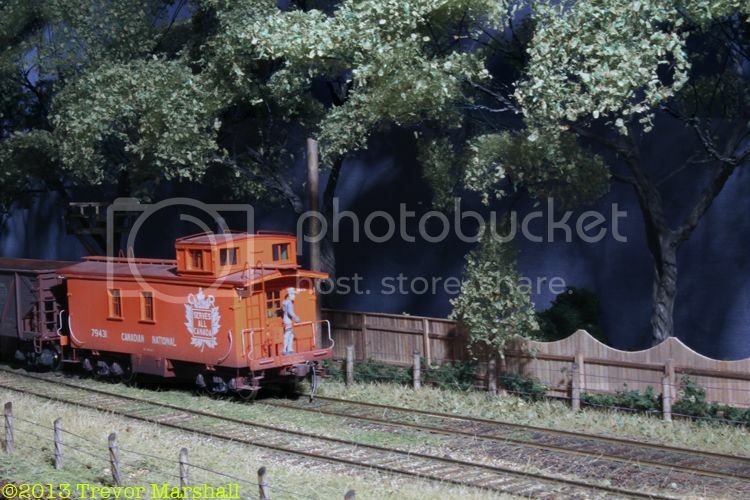 I shot between the weeds and other plants and didn’t worry about complete coverage – this was weathering on a layout-sized scale. My focus was the large expanses of meadow in Port Rowan… the banks of the Lynn River… and the larger areas of grass in St. Williams. But anywhere that I thought looked too burnt and dry got a spray. After leaving it alone for a few hours, I went back and buffed the rails to remove any ink that settled on them. 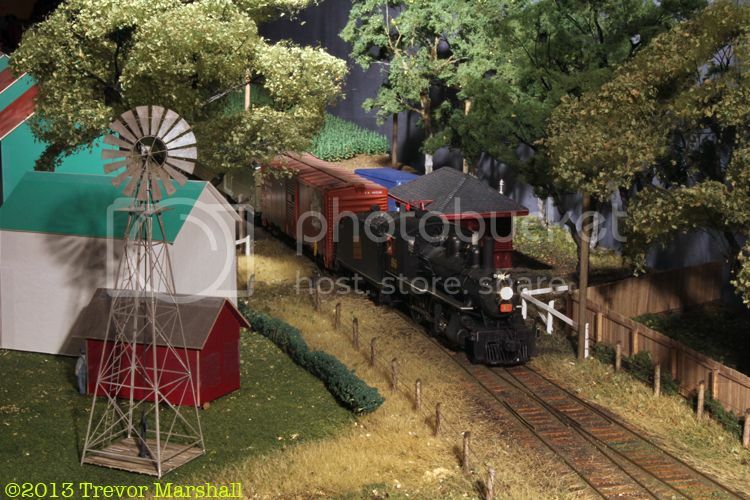 The green has helped blend everything together better, and the layout looks more like southern Ontario now. I’m glad I took the trouble to do this! Yesterday’s post was a teaser of sorts for this one. I’ve been working on the trees near the depot in St. Williams and I have – finally – built some that I really, really like. I’ve been working for a while on making my own trees, following the techniques Gordon Gravett has written about in his excellent series of scenery books. As I’ve written before, the armatures are twisted from many, many lengths of florist wire, then covered with Flexible Modelling Paste from Liquitex. I’ve been very happy with the armatures, but the canopy was eluding me. 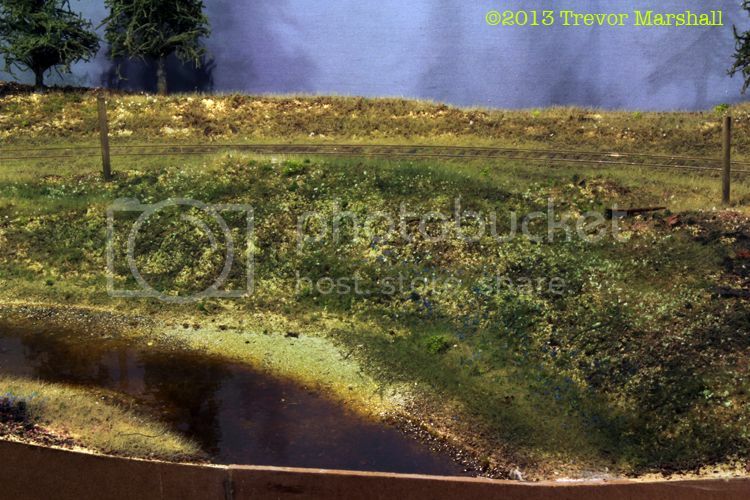 For the latest set of trees, I used Woodland Scenics Poly Fiber. I tear off small pieces – very small – and stretch them out, a lot. 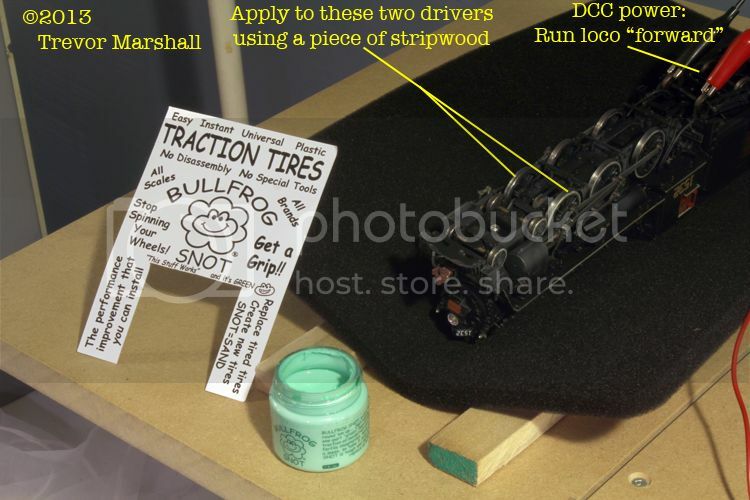 I then give each one a quick shot of spray adhesive, pick it up with a pair of fine tweezers dedicated to the purpose (since the glue can get, well, gluey), and lay it in a tray of leaf material from the Selkirk Leaf Company. While holding onto the Poly Fiber, I grab a fistful of leaf material and drop it on top of the Poly Fiber – positively bury it in leaves. I then pull the Poly Fiber out of the leaf pile, rap the tweezers sharply with my other hand to knock off lose leaf material, and add my new leafy fiber material to my armatures. Small pieces are generally better than big ones, although in some places I used large pieces to bridge between branch ends. I’m really happy with the effect. The trees look healthy with a canopy that’s dense yet significantly see-thru. 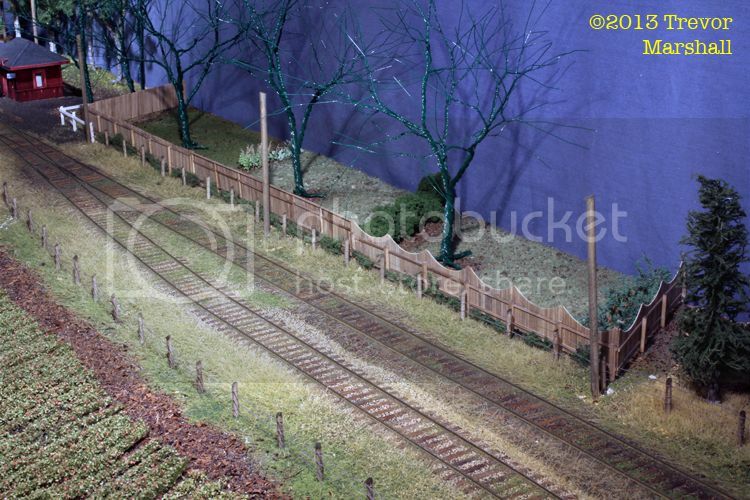 In particular, I like how the foreground tree (next to the white house mock-up) works with the ones along the back of the layout to create a short tunnel effect between the station and the farm field to the right (west). I spent the afternoon working on the layout. More in future posts, but here are few photos of the level crossing at St. Williams, where much progress has been made. Enjoy! I mentioned in a recent post that my CNR 10-wheelers are slipping a fair bit. It’s especially noticeable with The Daily Effort – the mixed train that patrolled my branch line. In part, the problem stems from the compensating trucks that I’ve added to the two passenger cars on this train. They increase the drag on the train – and while the 2-6-0s don’t seem to mind the 10-wheelers respond by losing their grip. 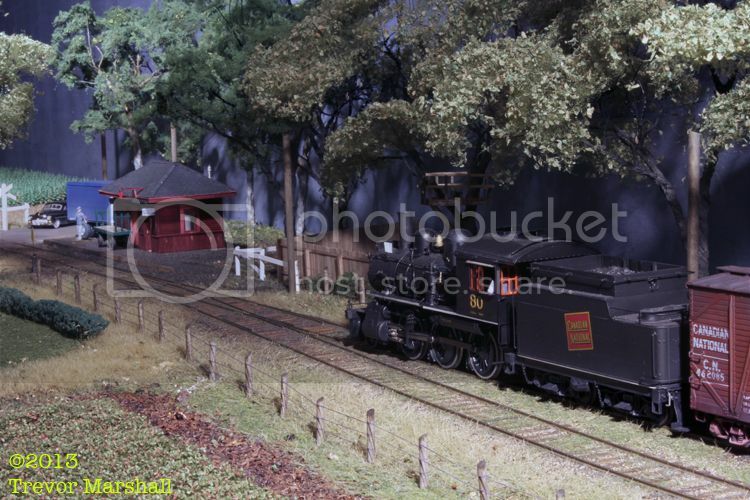 The 2-6-0s may be tiny, but I think they’re heavier – possibly because some space in the boilers of the 10-wheelers is taken up by their DCC decoders. CNR 1560 does exhibit some improvement and can now pull the mixed train, although there’s still some slipping. I’d like to improve it further. But 1560’s identical stable mate – CNR 1532 – continues to spin. I have several options for next steps. 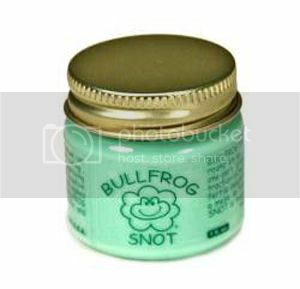 The first is to add a second, thin layer of Snot on top of the first and see if that helps. If not, I can clean the Snot off the driver and try again, perhaps on the rear pair of drivers. This isn’t really a big issue for me. The 10-wheelers run just fine pulling a freight train. And given that by 1957, the six-axle baggage-mail car was replaced with a four-axle full baggage, only one car in my later version of The Daily Effort will be fitted with compensated trucks – and that should not prove to be any trouble for a 10-wheeler. Well, the answer is at hand! I find the DVD fascinating for two reasons. Canadian National ran Rapido trains to Montreal, Tempo Trains to southwestern Ontario, commuter trains and long distance trains – including the Super Continental. CP Rail ran a variety of passenger trains too – from short-haul trains consisting of Budd RDCs to The Canadian. GO Transit – the provincial government-operated commuter service that’s so essential to the region today – was still relatively new and running pretty short (e.g. 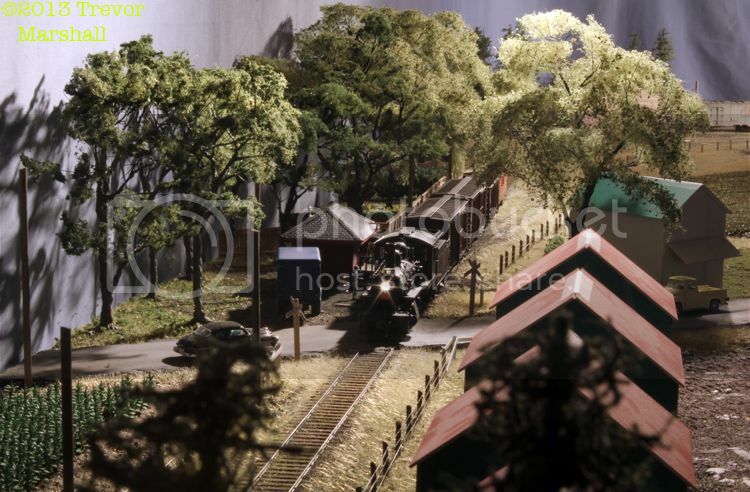 : model railroad-sized) commuter trains with cars from Hawker Siddley. They even ran some self-propelled cars that were reminiscent of RDCs – but, different. Ontario Northland ran long-distance passenger service to the province’s hinterland. Equipment was a mix of new and second-hand from U.S. railroads that had exited the passenger business. Locomotives were also varied, with examples from ALCo/MLW and EMD – including many oddballs such as CP Rail’s RSD-17 “The Empress of Agincourt”, and the GP40-TC on GO Transit. In addition to the many passenger trains, this DVD also captures freight transfers… local switching assignments… light engine movements… movements between coach yards and the train shed… and more. The second reason I found this DVD fascinating is as a reminder of how the landscape has changed in the Rail Lands of Canada’s largest city. The skyline from the 1970s is almost unrecognizable when looking at the city today. Key buildings still stand out – notably, the bank towers. And I was pleased to see some shots of the famous (locally, anyway) billboard for Inglis, which still offers up daily inspirational messages to drivers on the Gardiner Expressway. But almost all of the industrial tenants – those who used rail service for freight in the 1970s – have fled the core and have been replaced with condo towers, office complexes, and convention centres. And the rail lands have contracted considerably. Yards have disappeared, and open spaces have been filled in until today’s Toronto Terminal Railway property runs through the base of a canyon between sound barrier walls and high rises. It’s very, very different. It’s definitely still railroading – and more exciting than this video might suggest. (I used to work on the 17th floor of an office tower and my window overlooked the Union Station train shed. My colleagues learned very quickly that there was no point in asking me to do anything useful around 5:00 pm, when the station seemingly exploded with green and white commuter trains.) But it’s different. 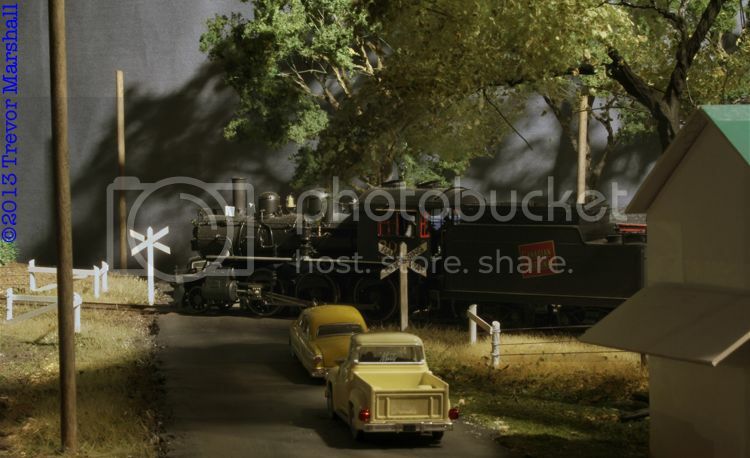 This post has nothing to do with Port Rowan, except that the 1970s were a formative time for me in my model railway hobby, so it’s great to see this stuff again. Anybody who lived in Toronto in the 1970s – or rail-fanned around the GTA during that period – will enjoy this DVD. I know I did: It reminded me why I became a lifelong railway enthusiast! While I have minimal real estate in which to do it, I want to suggest that there’s more to the town of St. Williams than a level crossing. That said, I also don’t want to crowd the scene with structures. How to proceed? 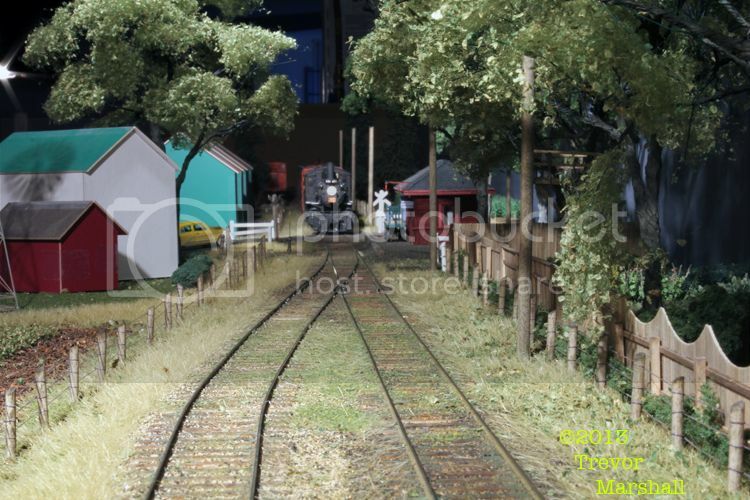 I’ve kept clear a plot of land to the right of the depot and my plan is to use this area to suggest some back yards. 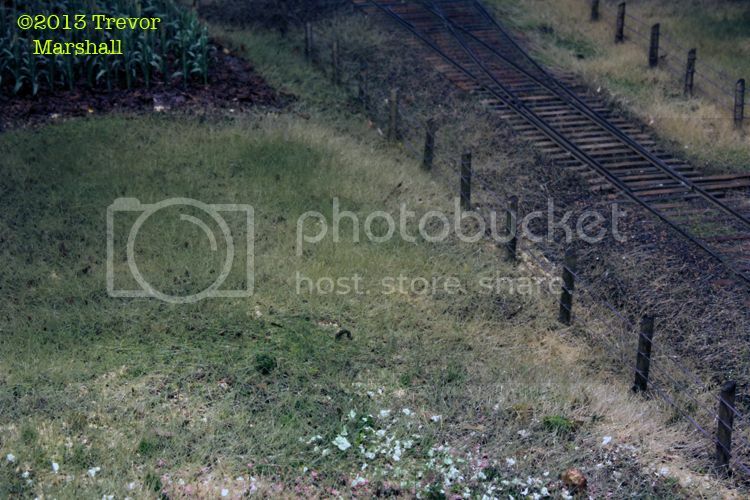 Naturally, anybody living this close to the tracks – even a rail fan – would want a privacy fence. 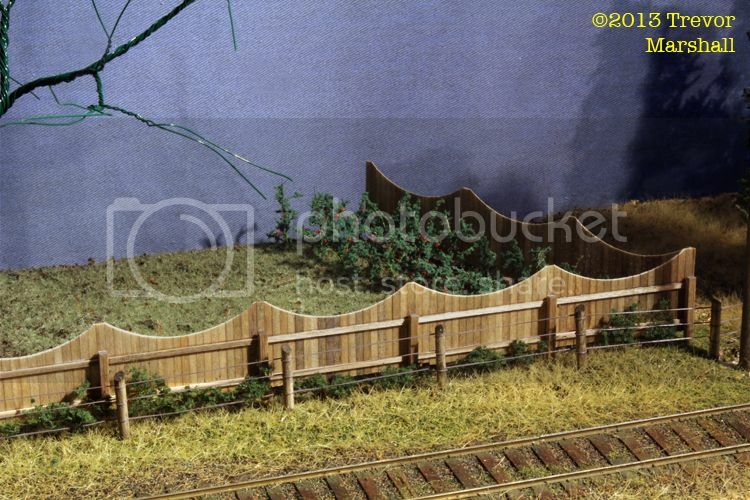 It became obvious that I would have to install this fence before I finish and plant the trees in these backyards, so I’ve spent a couple of days worth of hobby time scratch-building the fence. 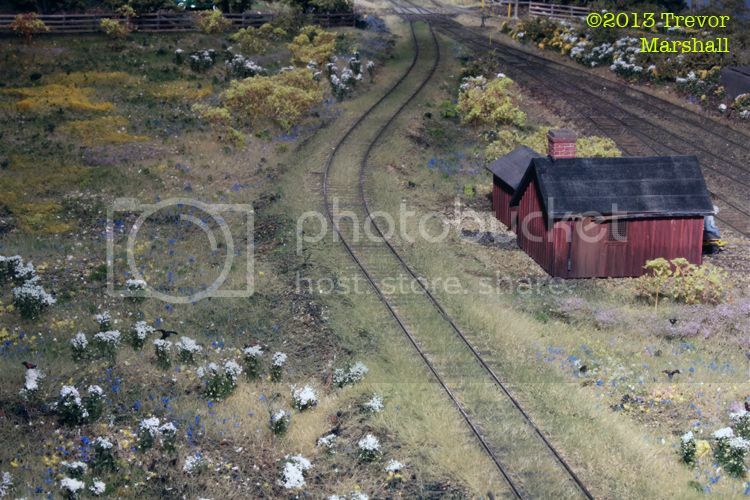 The property at left (closest to the station) has a simple board fence that’s fairly roughly assembled. The middle property has a tighter board fence built in panels between the posts, with a top board to trim things off neatly. The property at right has a more decorative fence, with the boards trimmed in arcs. Each property is 60 scale feet wide – actually, three times the width of the downtown Toronto property I’m used to, and a respectable size for a property in a small Ontario town. 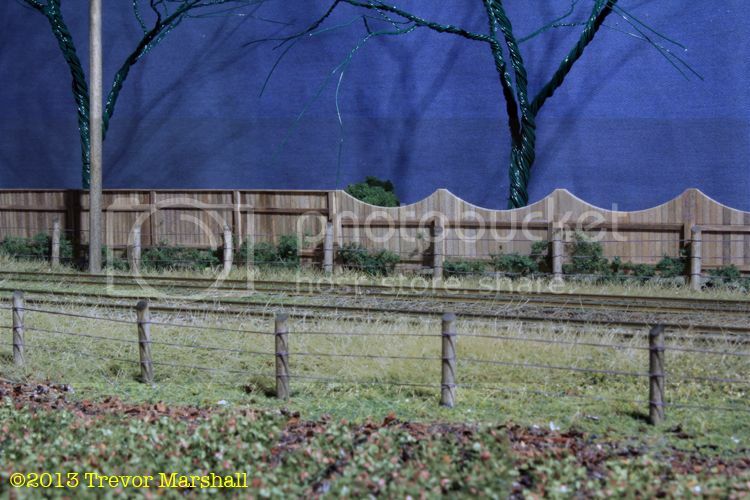 I have about a scale 30 feet between the fence and the back of the layout, and I’ve added short sections of fence at each end of this trio of backyards. In all, I built about 240 scale feet of fence – and I did it board by board, with each board distressed and stained before assembly. The project used a lot of scale 1″ x 6″ – several packages worth! I’ve also started to create the backyards. The glue is still wet in these photos, but I’ve added grass and some basic plantings. Look at the above photos and you’ll see some bushes separating the middle and right properties, and some flowers along the property line between the left and middle backyards. I’ll add a simple fence behind the flowers here. Lance notes that scene composition is the primary driver of realism. And he notes the biggest mistake modellers make is that they put elements too close together. They don’t leave enough space between features. For those trying to model a real place, as I do, a lot of the hard work has already been done for us. Most features in real life have plenty of space around them so if we’re modelling a real place, all we have to do is copy what we see. I resisted the temptation – it’s always a temptation – to pack more stuff into my layout space. 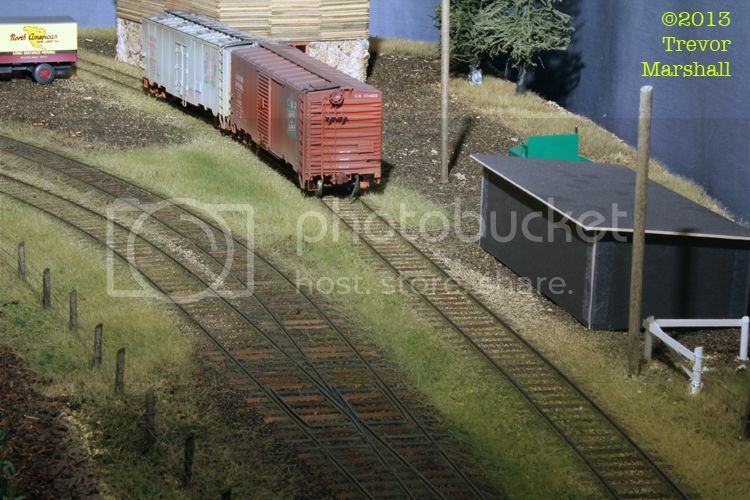 I devoted almost 1200 scale feet to the yard – from the first switch to end of track. This compares favourably to the prototype yard, which measured roughly 1700 feet from first switch to end of track. And as a result of not compressing things too much, I think I’ve captured a realistic representation of the space between things. 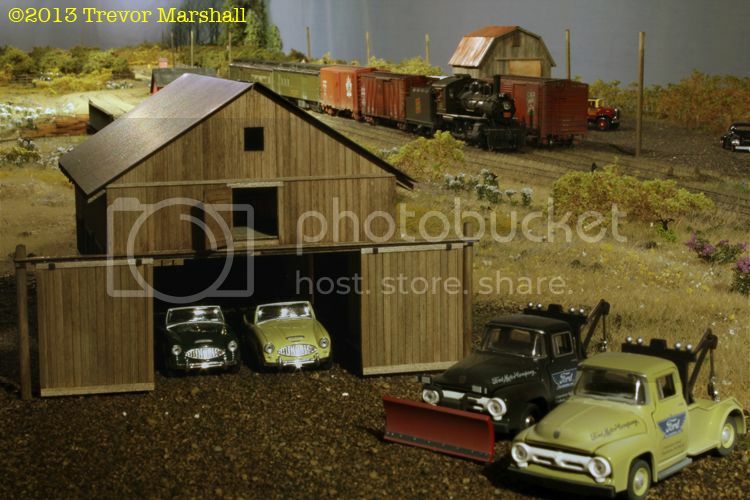 There’s space in the above scene between the four structural elements you see – the garage, the section house and turntable (barely visible over the far peak of the garage) and the small barn next to the team track. 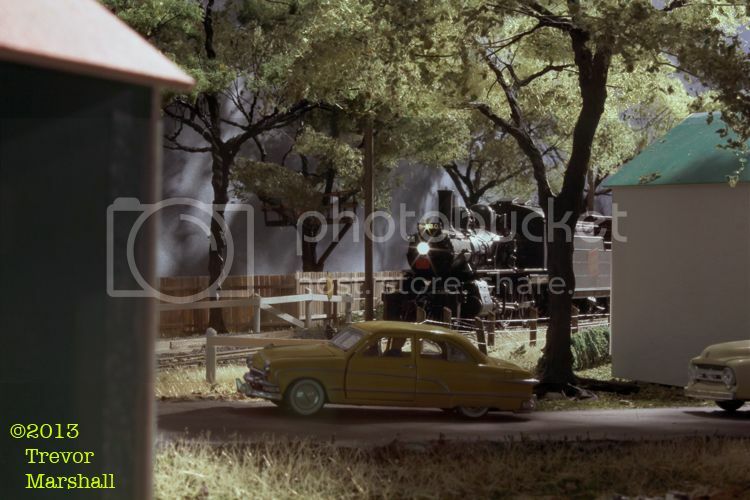 And while it can’t be seen in the photo, the coal dump is behind the last passenger car in the train, which places it at similar distances from other elements. It should also be noted that each of these elements is quite small, averaging 4 by 6 inches (the turntable is longer, but narrower, so it occupies roughly the same amount of visual space). Now, don’t obsess about the measurements. There isn’t a magic formula that says, for example, “the space between two elements should equal the sum of the square footage of each element”. I provided the measurements because it’s sometimes hard to appreciate the space between when looking along a scene like this. It’s obvious the barn is some distance away – but how far? Is it 35 inches? 42 inches? 68 inches? I think that knowing it’s 51 inches from garage to barn helps one put other aspects of the image into perspective. The structures draw the eye – so in between each, I try to keep the scene composition relatively neutral. That’s not to say that it’s dull: I’ve used big expanses of meadow, and the meadow is filled with wild flowers, shrubs and other natural features. But the eye tends to gather all of this visual data together into one concept – “meadow” – so it’s easy for one’s perception so slide across this space from one signature element to the next. Obviously, there are times when cramming elements together actually enhances a scene’s composition. For example, running tracks between retaining walls and in the shadow of skyscrapers conveys the sense of a big-city union station – while having the track hug a narrow ledge between canyon wall and rushing river helps tell the story of narrow gauge railroading in the mountains of Colorado. 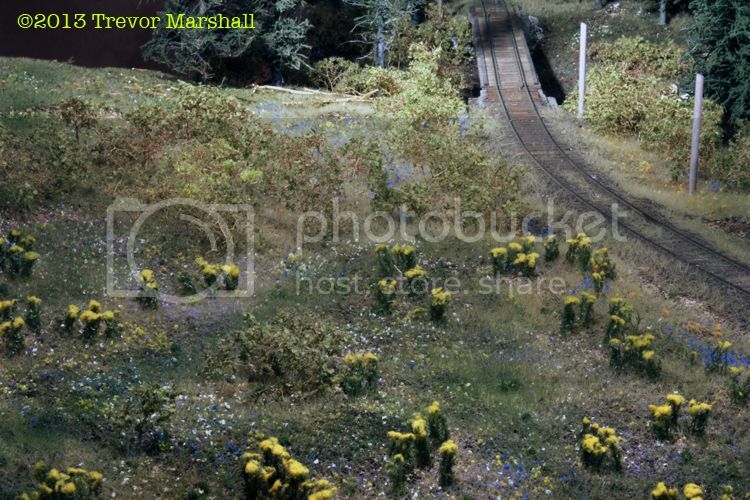 But most railroad environments are not that extreme and a layout too tightly packed may do many things well but will also come off as train-setty.